With constant advancements in imaging technology, a radiologist can more clearly see the signs of neck and lumbar strain. However, the proof isn’t always in the MRI or CT scan on the screen but felt in radiologists’ backaches, shoulder strain, and neck pain because of sitting in ill-fitting reading room chairs. When it comes to workplace ergonomics, radiologists are becoming the patients, with job-related musculoskeletal injuries on the rise. Filmless reading rooms full of monitors for viewing digital images have streamlined the reading process. While the industry is pleased with the improved workflow, increased productivity, and better images that come with filmless image archiving and PACS, these gains come at the cost of radiologists experiencing stress injuries similar to those of their patients. This is a common challenge when it comes to establishing proper reading rooms and workspace. According to Jack Dennerlein, senior lecturer on ergonomics and safety with the Harvard School of Public Health’s environmental health department, the long hours and nature of imaging work are risk factors comprising the epidemiology of radiology work. Radiology is unique, he says, in that computer usage in this field is two to three times higher than that of most other industries. When it comes to ergonomics, it’s not about how someone sits at a workstation but how to design the workstation so the user receives the proper biomechanical support when sitting. For work that requires users to remain seated for extended periods of time, such as a shift reading digital images, comfortable chairs can enable radiologists to focus more on their immediate task than on the pain in their back caused by inadequate equipment. In the course of establishing proper radiology workspace, however, desks and monitors often take center stage, with chairs becoming the most forgotten aspect of the reading room layout. The best-designed workspace falls short if the proper seating is not incorporated. In many cases with a busy reading room, people will often just pull in chairs from other locations with no consideration of whether that chair is appropriate for the space. Harisinghani says the subject of ergonomics in radiology became his “pet project” about five years ago. Since that time, he has participated in several studies on the topic. What those studies reveal is that the nature of radiology—sitting for long hours in a fixed position while focused intently on computer monitors—places even more importance on finding the right chair for the task. Decision makers also need to consider the environment within the reading room. For example, Dennerlein notes, if the floor is carpeted, the castors on the chair should be hard enough to gain traction on that surface. However, for rooms with a tile or linoleum floor, softer castors are in order. A softer castor will grip the smooth surface better yet still allow for free range of movement between monitors and workstations. One challenge in ensuring proper seating is an “ignorance” of what a bad chair can do to the body. Harisinghani compares it to someone who drives an older economy car. That person is used to how it feels driving something at the lower end of the vehicular spectrum. Give that person a new luxury car, however, and they realize the benefits of better comfort. “Once users realize what’s available to them, they know what they’re missing,” he says. However, the person using the chair isn’t always the person making the decision regarding furniture purchases, Harisinghani adds. Specialized equipment is often seen by decision makers as out of reach when it comes to cost. Part of that decision-making process involves budget. According to Russ Rogers, a lead project manager for office furniture with FRL Furniture in Westbury, New York, “the sky is the limit” when it comes to task chairs. But how much is left in the budget for chairs? Oftentimes, workspace planners take a one-size-fits-all approach to purchasing furniture, Rogers notes, which fails to acknowledge radiologists come in all shapes and sizes. Reading rooms are used by a variety of people on a multishift schedule, making chair adjustability important. “The ability to change adjustments throughout the chair is vital to making sure that a wide variety of people can use the chair comfortably,” he says. Asynchronous control is one feature to consider in a chair, Rogers explains, because it enables users to simultaneously alter the position of the chair back and seat. This provides users with back support even when they lean in to look closely at an image. Along with the back, head and neck support can assist with users’ varying sizes and sitting habits. Chairs with headrests prove beneficial when the workstation has a tilt option. Graham notes that if someone likes to lean back in his or her chair while working, that’s fine as long as there’s sufficient support for the position. As noted in the RadioGraphics study “Importance and Effects of Altered Workplace Ergonomics in Modern Radiology Suites,” of which Harisinghani is lead author, chair height should allow the forearms and hands to rest horizontally when the fingers reach the middle row of a keyboard. In addition, the elbows should remain directly under the shoulders with no angle at the wrist. The backrest should be angled to support the lower back. Chair backs also need to adjust to a full range of heights to accommodate users from 4 ft 8 inches to 6 ft 3 inches tall (or more), Graham says. Harisinghani’s study results note that chairs positioned too high can cause the radiologist to either move forward in the seat or sit upright without back support. “You want to have a height range in a chair that allows users’ feet to remain flat on the floor or to rest on a footrest under the workstation,” Graham says. When it comes to armrests, vendors note that using chairs where elbow rests do not provide sufficient arm support can cause an increase in the static load on the neck and shoulder muscles, resulting in chronic pain in the upper back, shoulders, and neck. The users’ shoulders subsequently make up for the lack of arm support. Armrests should also extend outward to help ensure that users can keep their arms and wrists straight, not bent back at an angle. Seat size is also a factor to consider when purchasing a chair. A seat slide can accommodate people with long or short legs by adjusting the depth of the back of the chair to the seat position. This allows taller people to extend the seat cushion out, allowing them to sit at the back of the chair while maintaining support for their legs. However, if the seat cushion is too large, it can pinch the user behind the knees. Sitting forward to compensate for the cushion size eliminates using the back of the chair for support. 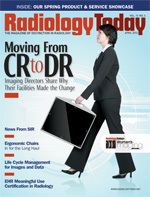 Education can help radiologists use chairs properly but can be a challenge for the vendor. In many cases, there is an intimidation factor when it comes to the knobs and levers on a highly adjustable chair. Making one adjustment can create a level of inertia that will throw the entire chair out of alignment, rendering it less comfortable than it might already be, so users do nothing. “They’re afraid to adjust the chair, so they just leave it the way it is and adapt,” Graham says. Also, knowing how to adjust chairs quickly enables users to make slight alterations throughout the course of their shifts, changing areas of greater support as fatigue sets in. Along with increased workflow and productivity, there is evidence showing that accuracy may increase as well.